In 1814 Jefferson noted that slaves Wormley and Ned were working on a "ha ! ha ! ", a barrier intended to keep grazing animals off the West Lawn. Unlike a ha-ha that Jefferson had seen at Stowe in England, the version at Monticello was a 500-yard long trench with excavated dirt mounded along either side. 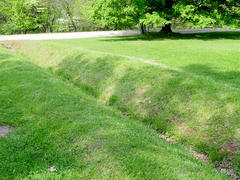 When covered with split railings these trenches resembled modern cattle grates.